See that post right there, all these Nigerian spammers and you guys still are not doing your job... Wow this forum is a disaster now, starts to sound like Trump. There are 2 of you! Filter by IP and anytime somebody posts a email address such as the one above. They have a very easy to spot common format why the phuck can't you control them. When you do not control them they will flood you as they are doing. You do realise that by deflecting my request to openly and honestly answer why you game the stats on trade 4 me, it's only going to hurt your brand further right? The excuse of calling everyone Randy or Louis or all these made up names doesn't work. Stats and numbers tell all. Also can you stop lambasting the management here in various posts telling them they don't do their job? I understand you were home schooled and never really held a real job and the concept of chain of command is alien to you but have some respect for those in charge. Hey TBN, I honestly I am confused now. This domain can be registered by anyone, so it is not a real proof. Can some mod maybe verify the email adresses of these both users? Perhaps one of them uses an email @thebinarynerd, so it is granted that this guy has access to the domain, as he needed to verify his account, right? Lying to people telling the you are me, how do you explain lying to people like this Randy? You always did love to attack people behind their back. The mods here are doing their best. Spammers fill up this forum every hour, they can't monitor it 24 hours a day. Last time I checked, you aren't in charge here anymore (thank god) so please stop berating the forum moderators in every thread. You clearly have a chip on your shoulder. 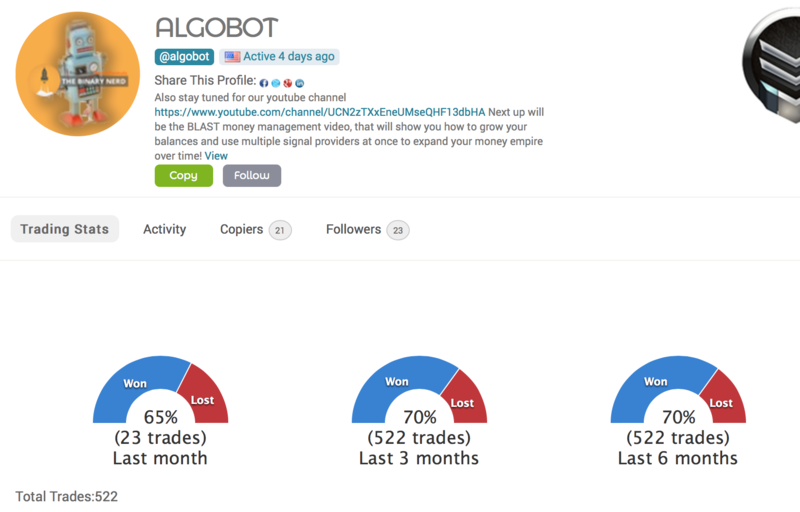 Your clients are coming into Hive asking why you don't give enough signals, so get back to gaming Trade 4 Me with "algobot". Just hope one of those clusters doesn't go the wrong way. Lying again, no I attack full frontal you scummy liar. You are talking about yourself you delusional freak. I do agree I am abusive and none to nice at times but I don't backstab I attack say what I think full frontal you creep. Ok this guy is definitely Gabman. Forwarded to mods. Pavel says -" I will say this, so if the real lotzofbotz doesn't trade on Trade 4me then I'll take down my thread on him." <-- Go PHUCK yourself Loser! You shout at the mods all day for not keeping the forum clean. This thread is not for arguing over your fake stats, I created a thread for that so take it there. Your stats did change over time. In November and December you launched 500trades, had a few lucky wins, so your ITM got pegged at 70-80%, in Jan your ITM dropped to 60% and even 30% at one stage, so your averages are slowly coming down. Here is a snapshot, 500 trades on a demo account and just 23 last month. I wonder why. Mods here support Randy who has been previously banned from BOTS/BOE and many other places. He has shown here to be lying to users pretending to be me. I want TBN removed from this forum. I am publicly asking for this from the mods. I am sure you don't support RACIST HATE speech on the site or fraudulent imposters coercing bin.net users? Or do you? nobody here supports Randy, and frankly, you aren't very nice yourself. Just FYI. listen, you and he are the same guy, quite trying to pull of your BS. It's getting really old. Good one. This all adds up now. So that one gets banned and one survives either way lotzofbotz remains in the forum. Quite smart. Shame Lotz the mods that you bash all day are actually smarter than you. As I said earlier, shut up and get back to gaming Trade 4 me. Thank you, MH did the right thing and really it is of no use to go back and forth with you Pavel, I wish you good trading for the future. found this thread trying to get some insight to markets world. Good to hear they can be trusted. Everyone's human and has problems as a business that they need to deal with from time to time, but I think I've finally seen enough good comments to be sure their alright. I had some replies from a forum user who asked me to contact him by email. I had grave doubts about his credentials but went along for the ride to see what he had to say. I won't mention his user name as I'm not sure if he is a scammer lurking on the forum, but I think he may well be. I will only inform the administrator privately, if that is possible. He offered to trade for me or put me in touch with unnamed brokers. I think he may be an affiliate for scamming operations , but I'm not sure. you should let us know who that is, it is improper behavior and a scam. Don't trust him. Proof of account, proof of "amazing" profit. Words are not enough here. Hi guys, I'm Pamela. I'd like to stay connected with people who are trading to be able to know which companies are legitimate and which might be very high risk. I recently invested with 2 companies and it's been a really bad experience. Is this a good platform to discuss? Please share details of any companies that you don't trust. I am still investigating one of my investments myself, but I have been able to confirm that Arbi-trade is a scam. I can't get hold of anyone and can't even get onto the website anymore. Hey, don't trade with "no-name" brokers. Get a regulated and well-known broker like 24Option. Go to the main page here and check out the reviews and compare but always pick a regulated one. hello, im publishing an arrow indi called "Green_Wall_Arrows" on mql5.com market is still being reviewed by them, and hope is published this or next week. Is for forex, but im having good results on iqoption bullet trades, plan test some binary trades also. I would like moderators or anyone to watch my sharing screen of me doing trades, in order to ask people to try it. Im new to marketizing a product also, not willing to spam or do a mess on your forum.